The Silva Screen Records release of Never Say Never was the first ever CD release of the 1983 film score composed & conducted by MICHEL LEGRAND featuring the theme song performed by Lani Hall. 30th ANNIVERSARY of the JAMES BOND FILMS. The first CD release for this rarest of all JAMES BOND scores was previously only available as an LP in Japan until Silva Screen lovingly restored the soundtrack for release on CD. Artwork incorporates stills of SEAN CONNERY as 007. Michel Legrand - Bond Smells a Rat / Nurse Blush? 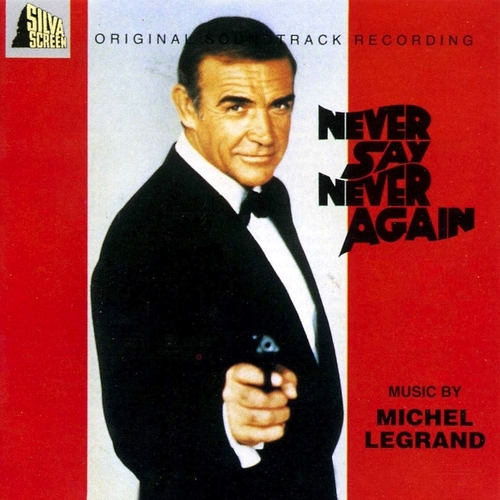 Michel Legrand - Bond In Retirement / End Title "Never Say Never Again"
Michel Legrand, Alan Bergman, Marilyn Bergman - Bond In Retirement / End Title "Never Say Never Again"